VERNON HILLS, IL (October 2010) – Duo-Fast® Floor Fastening Systems (www.duo-fast.com), a leader in carpet and flooring installation tools for more than 40 years, is introducing Jet-Tac™ Tack Strip Epoxy, a quick-set epoxy that is ideal for tack strip installation on concrete or wood. "We've done our homework and listened to what carpet installers are looking for in fastening tack strip to concrete," said Rita Bockrath, Marketing Manager for Duo-Fast Floor Fastening Systems. "Jet-Tac™ has a number of features never before seen in this industry that are sure to save carpet installers time and money." Jet-Tac™ is the first two-part epoxy that comes in a uniquely designed 10 oz. (250 ml) cartridge with nozzle that can be used in a standard caulk gun. * The specially designed nozzle allows the two-part epoxy to be fully mixed by the time it reaches the end of the nozzle; thus, no mixing by hand, and no special tools are needed. Unlike hot-melt glues, Jet-Tac™ sets up in 5 to 7 minutes, allowing enough time for the installer to apply the adhesive and position in place full strips for additional savings. It also features a superior holding power formulation and a cure time of just two hours. Carpet installers will appreciate this because it allows power stretching on the tack strip after just two hours; they no longer have to come back much later in the day or the next day to complete the installation. Due to its superior holding power formulation, installers can apply Jet-Tac™ in dabs rather than a continuous bead, meaning they need to use less than competitive adhesives to obtain superior results. In addition to using less Jet-Tac™ adhesive per installation, the cartridge can be opened and resealed without the epoxy setting up inside the cartridge. Users can leave the nozzle on the cartridge and replace it when ready to use again, or reseal the cartridge with the included nut and cap. Jet-Tac™ Nozzle Kits, with three replaceable nozzles per pack, are also available (part no. 650650). Jet-Tac™ is very stable; it can withstand temperature ranges from -40 F to 160 F without changing composition. Once it is fully cured and set, water will not affect the adhesion strength of Jet-Tac™. Jet-Tac™ is ideal for tack strip installation on concrete, but works well in many other applications, including cove moulding, carpet shims, transitions, ceramic, and metal bonding to concrete or wood. 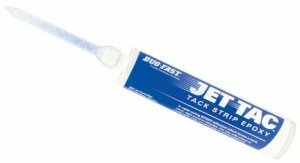 Duo-Fast Jet-Tac™ Tack Strip Epoxy (part no. 650651) will be available in early 2011 at flooring products distributors throughout the U.S. For more information, go to www.duo-fast.com or call, toll free, 888-DUOFAST. *Jet-Tac can be used with any standard caulk gun. However, Duo-Fast recommends using a caulk gun that features a four-fingered trigger.